Farmer Joe Rolfe is standing in a field of perfectly edible but unsaleable sprouts. Mr Rolfe, manager at an organic farm near King’s Lynn, Norfolk, says the losses will run into “thousands and thousands” for the 10 acres of sprouts – about 120,000 sprout trees – because they have “some pests in them”. The 27-year-old has been eating them himself all week as they only need to be washed by hand, but “we can’t sell them to the supermarkets because of the way they look with pest damage”. There has been a lot of attention on food wasted by supermarkets and consumers, but it is estimated that 20 to 40 per cent of fruit and vegetables grown in the UK are rejected on cosmetic grounds before they even get to the shops. To create more awareness of food wasted at farm level and “to put something back into the community”, Mr Rolfe invited a team from the Gleaning Network UK to the farm last Thursday to glean the sprouts along with a trial crop of kale, kohlrabi and cabbages. Gleaning is the practice of gathering any remaining crop left in the fields after harvest and has been carried out in Europe since the Middle Ages. But it is now growing in popularity again, thanks to the work of the network. It organises gleans around the country and gives the fruit and vegetables to charities such as Fareshare, which redistributes them to school breakfast clubs, women’s refuges and luncheon clubs for the elderly. It would be too expensive and logistically difficult for farmers to organise gleans themselves. Instead, the crops that don’t make the grade are ploughed back into the field or used for animal feed. “It’s an expensive way to feed cows,” says Mr Rolfe. Martin Bowman, gleaning co-ordinator for the Gleaning Network UK, part of environmental group Feedback, says a combination of the strict standards of retailers and “consumer fussiness” contribute to farm level waste. “It’s undeniable that we need a shift in consumer attitudes to wonky fruit and veg, but also retailers have played a huge part in shaping that expectation,” he said. He points out how many retailers use their fruit and veg at the front of the store to entice people in and put more emphasis “on the cosmetic rather than the nutritional value of the produce”. The network’s first glean took place on a Surrey apple orchard in 2011 and is spreading around the country, with hubs of volunteers in Manchester, Bristol, Brighton, Cambridge, London and Kent. To date, the project has gleaned approximately 110 tons of produce, equivalent to one million portions, with more than 500 volunteers across 55 gleaning days. Although Thursday’s glean was on a gloomy day, the weather did little to dampen the enthusiasm of the 10 volunteers who had travelled from London, Suffolk and Cambridge to take part. The project usually tries to recruit local volunteers, but because of the short notice of gleans, it is not always possible. Mr Rolfe gathered the group together in drizzly rain to explain how to harvest each crop, while fat pigs on the neighbouring field squealed in the background. Kale is harvested easily by hand by pushing down the outer leaves and then pulling back up and off – “deeply satisfying” said one volunteer – while sprouts require a large machete. After several hours, a local homeless charity, the Ferry Project, arrived to pick up the produce to take back to its shelter in Wisbech. 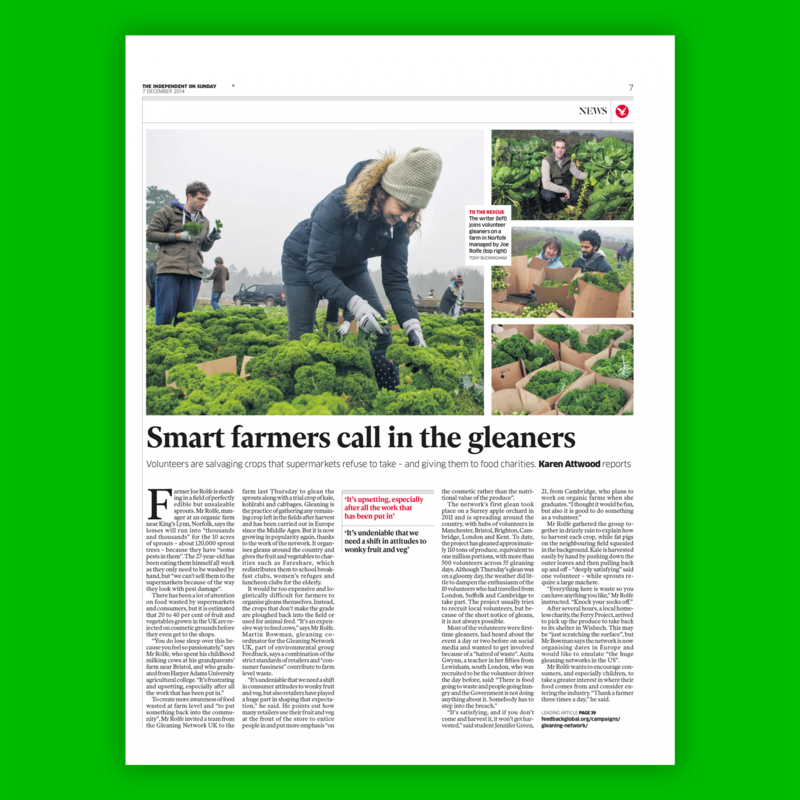 This may be “just scratching the surface”, but Mr Bowman says the network is now organising dates in Europe and would like to emulate “the huge gleaning networks in the US”. Mr Rolfe wants to encourage consumers, and especially children, to take a greater interest in where their food comes from and consider entering the industry. “Thank a farmer three times a day,” he said.